In part 1 of this series, I looked at why you should include box squatting in your routine, regardless of whether you're a raw lifter or not. This part will look at some common questions regarding box squatting. Common Question #1: Louie Simmons says to not free squat at all except in competition. Should I do that and expect wild increases in my raw squat? There is no right answer to this because so many scenarios exist. Firstly, there are different kinds of squatters - the long femured squatter and the short femured squatter. The long femured squatter will have a better time with a moderate to wide stance and being a bit more hip dominant with their squatting, while the short femured squatter is more comfortable with a close to moderate stance and generally being a bit more knee dominant when squatting. 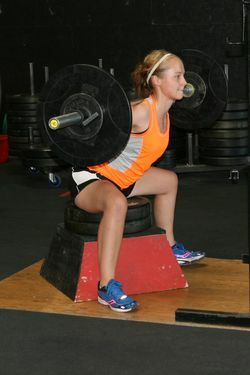 Box squatting technique is very clear that you want a moderate to wide stance, and box squatting is performed for strengthening the hips and hamstrings. Because of this, it is my opinion that box squatting will not help the short femured lifter, as this lifter is not very hip dominant when squatting. This could be the discrepancy as to why you see people that either swear by the box squat, or people that hate the box squat. Consequently, for the long femured lifter, I think the box squat would help a lot because of the exact reasons stated above. However, the SAID principle applies here. If you want to be a good raw squatter, you should practice raw squatting. In the box squat, the knees do not travel forward. In the raw squat, the knee travels forward, which means more quad reliance. Box squatting when done right does not engage the quads at all. As you can see, there's no right answer. Try it out and see if it works for you. Don't take what people say as gospel. If somebody told you to sumo deadlift, would you drop every other form of deadlifting? I sure hope not. Common Question #2: But so and so elite squatter tells me box squatting is completely useless...? Let me stop you right there. Refer to common question #1. What works for one person usually won't work for another. Find a lifter who has your exact proportions and see what works for him. Also keep in mind that elite squatters are more concerned with taking their squat from 750 to 770. They already know at that point what works for them and what doesn't. Most people don't have this problem and just need to get stronger. Box squatting is one way to get stronger. One good looking box squat. Common Question #3: Most elite squatters throw out box squatting in favor of pause squatting. Should I do them? Aren't they the same anyway? This is a very common misconception. Pause squatting is not the same as box squatting at all. The only way in which they're similar is that they both require you to pause in the bottom. The pause squat is a regular squat with a pause for however long in the bottom. This teaches you to stay tight, explode out of the hole, and builds tons of flexibility. The box squat has you sitting back with a wider stance, with shins almost perpendicular to the box, and relaxing the hip flexors in the pause. The sitting back and the brief relaxation makes all the difference. The sitting back places the stress squarely on the posterior chain. The brief relaxation and breaking of the eccentric-concentric chain is what makes the box squat such a powerful weapon. To get the weight moving again, you need to turn on all muscle fibers at once. If you look at part 1, you'll notice that the box squat excelled in RFD compared to normal squatting. I don't have any research on RFD generated during pause squatting, but I believe that box squatting would be higher because of that breaking in the eccentric-concentric chain. You can't break the chain during pause squatting because you need to stay tight in the hole and never relax. So treat box squatting and pause squatting as two different variations, not substitutes for each other. The pause squat is more specific to the raw squat and is a good idea to be implemented in a training cycle. Common Question #4: I see lots of box squatters rocking on the box. Should I be doing this? I am firmly in the camp of don't rock on the box. Lifters tend to let the tailbone tuck under when rocking and then use momentum to drive the bar up. This defeats the entire purpose of the box. Stay in your squatting angle the entire time and you'll reap the benefits. Dave Tate reaping the benefits. Common Question #5: So if all I do is box squat, can I go into a competition and expect to hit major PR's? See common question #1. The form for a box squat, when done right, is not the same as a free squat. As Louie Simmons says, in a box squat, you squat back not down. In a free squat, you squat more down than back. For optimal results before a competition, you want to use the free squat more to get used to the form and to prime the muscles to react with those leverages. What usually happens is that your body starts looking for the box behind you when free squatting. Practicing what depth feels like without the box takes a couple of sessions. So, for optimal results, do away with the box squatting before competition, and get used to regular squatting. Common Question #6: Will box squatting negatively affect my regular squatting? No. It may temporarily cause it to go down if you exclusively box squat, but it will catch up soon enough. It's more the technique difference that causes that temporary drop in numbers than anything else. Common Question #7: I box squat WAY more than I free squat. What's going on? You're using a box that's too high. People misjudge what parallel is with a box. Remember that in your bottom position, your hip crease needs to be inline with the top of the knees or lower. The last part of this series will focus on ways to incorporate box squatting into your routine for best results. Here's a video of Fred "Dr. Squat" Hatfield hitting a big big squat.